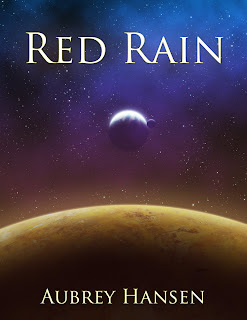 Red Rain is a recently-released sci-fi novella by Aubrey Hansen- her first published work, actually. I read it last week (actually, I read the finished version for the first time, though I had read a rough draft previously before agreeing to score the trailer). The worldview in this book is obviously a big selling point, as it is a Christian book. But that could be said of just about any "Christian" book, couldn't it? I doubt it. Red Rain isn't just a story with a "sinner's prayer" slapped in there somewhere. It's constructed on the worldview of Christianity. And while there's never a "gospel presentation", the whole book is a presentation of the Gospel lived out. The heroine is feminine- strong, but very clearly female. The relationship between the heroine and her family is a very good one, beautiful to behold. She is submissive to her father, and honors and obeys him. The stereotypical free-willed girl and oppressive father are totally absent here- what a relief. Just because there's no "pray-a-prayer" scene does not mean that this book is weak on Christianity. To the contrary, it is quite distinctively Christian, but doesn't have to rely on a cheap and forced "gospel" presentation to make it so. The book shows homeschooling as a good thing. Oh yes. ...though not perfect, of course. The thing that bothers me most about it is the possibility of spiritual pacifism and isolationism coming through. I don't know what Aubrey believes on this subject (and it wouldn't surprise me if I find out shortly after writing this review! :-), but the book could be interpreted to say "if they'll let us keep our religion and our Bible when we're in our house, that's all I ask." This must be reconciled with The Great Commission and The Dominion Mandate. Any other worldview concerns aren't really even worth mentioning, as I recall. And it looks very nice. A bit simplistic on the front and side covers, but professional and clean. As for the inside- quite nicely done. Now for the real art of the book- the story. The characters were very engaging and easy to visualize. The dialogue scenes were, in my opinion, some of the best parts of the book. The dialogue is well-written and engaging, and there are a few points where it's so heartfelt it's heartbreaking. The protagonist is very endearing and the villain is satisfactorily villainous. The book is also complemented well with a small (it is a novella) host of supporting characters that are memorable and believable. Aubrey's writing style is very enjoyable, moving from funny to poignant with ease. The story was excellent. My family and I have talked about this. It seems to me that so many homeschoolers write stuff, but that they rarely take the time to learn their craft and craft their art so that they move from good stuff to good stories. This is a pet peeve of mine. There were a few lines that kept popping up that I thought were painfully cliché and/or over-epic. Not that I read or watch a lot of sci-fi, so that could be just me, but a few phrases seemed too forced- like they were supposed to be epic but just ended up cheesy. There were a few weak scenes, and a few religious inclusions that seemed forced- not because they didn't belong there, but perhaps because they could have been better integrated into the story. My last critique (for now, mwahaha) is that it seemed rushed. It wasn't terribly so- just a bit fast. I wished that there had been a little more time taken explaining and developing. Yes, it's a novella, but just a few pages more might have gone a long way. If you're going to read fiction, this one is worth it. Its combination of good worldview and good story is very much worth the price and time. It lacks the last bit of professional polish, which might be expected from a first book. It also delivers very well on tension and gripping, bittersweet fun. Will I read it again? I doubt it. But, counting the rough draft, I read it twice, and enjoyed it both times. Will I have my kids (LORD willing, one day) read it? Probably. Would I recommend it? I appreciated reading your thoughts, as I recently finished reading - and enjoying - this one myself. I see your point about the spiritual pacifism and isolationism. Though I don't know Aubrey's convictions on the subjects either, I didn't take the story as supporting that sort of (erroneous) belief system. I thought it was more a case of showing that while religious freedom should be pursued, there are still wrong ways of pursuing it. What I've heard about it has been good, though. Thanks for this review! First let me say that I am honored and delighted that you gave my book a full-out Gabriel Hudelson review, with the Worldview and Art and everything! I value your opinion, so it was a wonderful surprise to find that you'd done a full review. Thank you so much! I'm very glad that you enjoyed the lived-out Christianity (as opposed to tacked-on proselytizing). That is one of my convictions about fiction. I think the Christian genre needs more realism in this area, and it's been very encouraging to me to hear the positive response to this element of my book. On spiritual pacifism, Corey's right in that I wasn't intentionally supporting that belief; however, I see where you might have gotten that impression. My focus with this book was on non-compromise - the idea that to gain a good thing with bad means is sin. I didn't give the pacifism angle much thought, so I'll have to watch that in the sequel. Which brings me to that point... Blindly following the crowd, are you? ;) Well, my readers convinced me to THINK about a sequel, and by thinking I got ideas. Right now there's tentative plans for two more books ("Blue Fire" and "Black Storm") - and that's it! The primary reason people wanted a sequel was for more exploration into the themes and characters from book one. Which is going to be an interesting challenge for me as the author... Right now I'm so caught up in the potential plot that I'm forgetting this laundry list of stuff I'm supposed to explore! Anyway, enough rambling from me. I ramble enough elsewhere. Thanks so much for the review, Gabriel, and for helping me with the trailer! I hoping to listen to this soon, as I'm downloading the audio version. (I won't listen to it yet, since I think it will drive me nuts to wait for the end! :P) A good review! Good review, Gabe. I finished listening to the audio version only today, and I really enjoyed it! Maybe we can talk more about it at the Reformation party; I'd be interested to hear which sentences exactly came off as cliche to you. I can't seem to think of any myself, but I didn't READ the book either, I LISTENED to it. That can make a difference!